This is one of the most RARE AND COLLECTIBLE, Audemars Piguet Royal Oak models in beautiful, Rose Gold and Tantalum case. 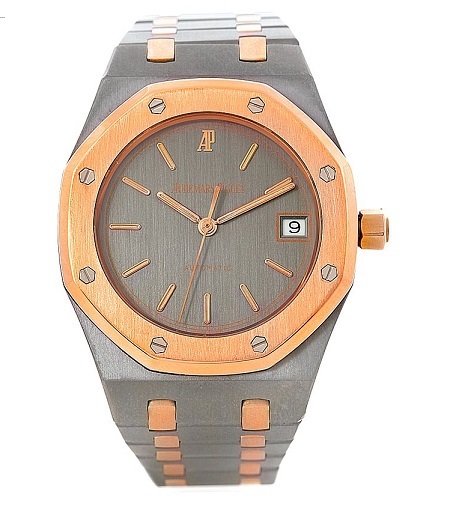 It is a Pre-owned, in ABSOLUTE, LIKE NEW CONDITION, WITH ORIGINAL AUDEMARS PIGUET BOX. Rose gold bezel and Tantalum case, traditional 36mm case, automatic movement, screw down crown, with date indicator, and solid Tantalum case back. View our other Pre-owned Luxury Watches. CALL US 956.687.2981.